Seems like every year when we go Christmas shopping we come across some previously undiscovered furry things — both new works, and how-did-we-miss-this? recent stuff. Kind of straddling both of those is Ninja Timmy, a hardcover book for older kids written and illustrated by Henrik Tamm. From Random House, the publisher: “For fans of the film series Shrek and the Chronicles of Narnia and of Frozen, as well as classic books such as Fantastic Mr. Fox, The Cricket in Times Square, and The Mouse and the Motorcycle, this imaginative and engaging debut middle-grade novel by author/illustrator/animator Henrik Tamm includes plucky animal characters, action-packed adventure, and lush full-color illustrations throughout. Timmy the cat, his pal Simon the mink, and the pig brothers Jasper and Casper are inventors, and they’re hoping to sell their fabulous new contraption to a local merchant. With high hopes, they haul their machine through the crowded streets of Elyzandrium—and are promptly robbed by a gang of bullies. With the help of two new friends, Alfred, a kindly old toymaker, and Flores, a skilled cat pilot, Timmy and his pals set out to get back what is rightfully theirs. As it turns out, they’re not the only victims of these dastardly criminals. But what can this band of misfits do? 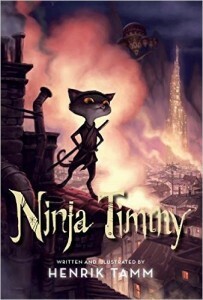 In this action-packed adventure, the intrepid Timmy and his wily friends transform themselves into crime-fighting ninjas—and quite possibly heroes!” By day Mr. Tamm is a conceptual artist who has worked on movies as diverse as the Shrek series and The Chronicles of Narnia. Ninja Timmy was published a couple years ago in his native Sweden, but now it’s available in English over on Amazon.